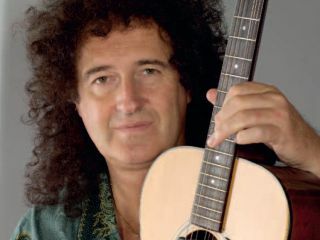 Brian May talks Queen: "we're still breaking ground"
Queen + Paul Rogers are fast approaching the halfway stage of their monstrous Cosmos Rocks European Tour 2008. Tomorrow night (10 October) marks the band's triumphant return to UK-soil with a gig at the Nottingham Trent FM Arena, but it's the 'unknown' locations that Brian May is most excited about. About which the guitarist revealed how it's "nice to still be breaking some ground." Our friends at Guitarist magazine caught up with Brian May during the tour's production rehearsals last month. May was exuberant: "We're gong to the Ukraine for the first time ever, expecting 200,000 people, which is unbelievable. It's one of those 'firsts', which is nice." "We've never been there, never performed there obviously. It's also the first time for Queen to play in Moscow and Latvia as well, so it's nice to still be breaking some ground; quite incredible actually." The Ukraine stop-off was the first in Europe, and ended up exceeding even Brian May's expectations. Queen played to a whopping 345,000-strong crowd - ground-breaking indeed. If you haven't got a ticket for the tour, A) you should have, and B) never mind, Guitarist witnessed (and photographed) the whole shebang. You can read the entire Brian May interview and watch a behind-the-scenes video of the production rehearsal in the November issue of Guitarist (on sale 28 October). More details and tour dates here.